Vienna is known as the City of Music for its musical legacy. It’s also been named the best city in the world for its quality of life, and it has beautiful architecture… so it’s no wonder that people love visiting. And while visiting this city isn’t cheap, it is still fairly affordable when compared to other major European capital cities. 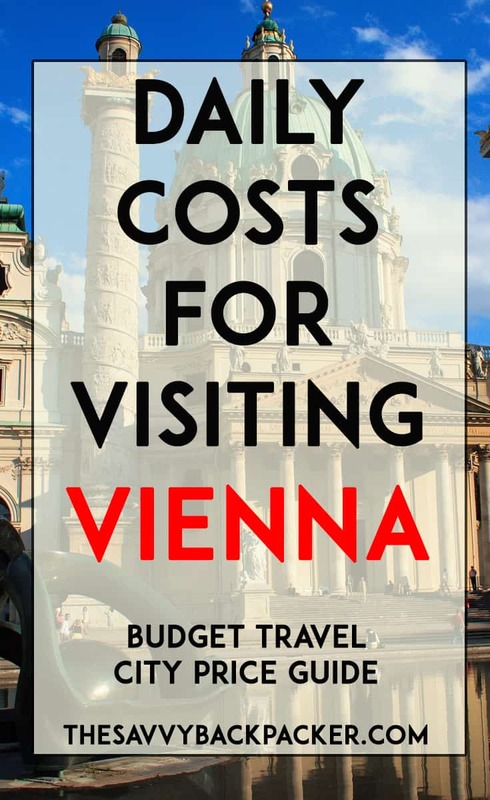 Attractions in Vienna can get a little pricey, especially if you want to see multiple things. However, the city is gorgeous, so you can happily spend your days sipping coffee at a sidewalk café. Check out the Vienna Pass if you plan on seeing multiple attractions (see our Vienna Pass Review for a more in-depth look at this sightseeing pass). In general, food in Vienna can get fairly expensive, but there are still plenty of budget options. Scope out the good value options before you head out for the day or you might risk spending more than you’d like. Read more of our strategies for Eating and Drinking in Europe on a Budget. Traditional Viennese food includes wiener schnitzel (breaded and fried veal), tafelspitz (boiled beef), and sauerkraut. Markets located throughout the city offer fresh fare and ready-to-eat items, plus they provide an authentic Vienna experience. 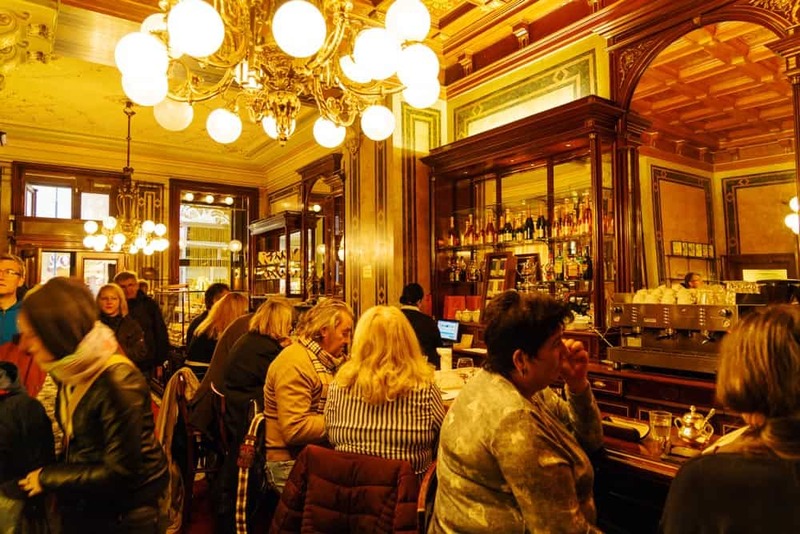 Cafés are popular and common – the Viennese love their coffee. Mokka (espresso), verlangerter (espresso and water, also known as a Café Americano), and einspanner (double espresso with whipped cream) are common. Expect to spend €1.75-€3. Breakfast – at Café Merkur or any other hole-in-the-wall café – will run from €1.50 (for a pastry) up to €3-€5 for a full breakfast spread. Blueorange: Nice spot for bagels and coffee. Vollpension: Lovely place for a quality breakfast at a nice price. Strock: Lots of lovely baked goodies. Knoedel Manufaktur: Try the traditional sweet Austrian Knödel for breakfast. Cafe Jelinek: Old-school coffeehouse. Not super cheap but a fun traditional vibe. L. Heiner K.u.K. Hofzuckerbacker and Demel K. u. K. Hofzuckerbackerei: Ok, these two pastry shops aren’t exactly cheap but they have a lot of excellent baked goods. Worth the cost. Visit one of the city’s markets – Naschmarkt, Brunnenmarkt, or Carmelitemarkt – for fresh food and goods. Small cafés offer takeaway for open-faced sandwiches, schnitzel, and fries. €1.50-€6, depending on what you get. Buffet Colloseum (on Nussdorfer Strasse 4) is recommended for its old-school canteen feel and cheap, great food. Pita, falafel, schwarma from a cart will run around €3.50-€5. Pretty much all the options from the ‘Budget Lunch’ section above also apply for dinner. Traditional Austrian schnitzel will cost €7.50-€14 depending on type. Again, the city markets are a good choice for cheap, ethnic (Asian, Greek, Middle Eastern) food. €5-€8 for a meal at one of Naschmarkt’s stands, or €6-€10 at a stand-alone place (Maschu Maschu is recommended for falafel and sides). Wiener Deween is a buffet-style place where you pay what you want: mostly Pakistani food, and popular among tourists and students (buffet is available all day). Pizza runs €4-€7 at local places. Gasthaus Elsner: Cozy family-run restaurant serving up nice traditional dishes at affordable prices — try the Wiener schnitzel. Popular with the locals as well. Bitzinger Wurstelstand Albertina: A super popular spot for sausage — very busy at lunchtime. Vienna Sausage: You can’t go to Vienna without getting a sausage. Schnitzelwirt: Super popular restaurant serving up authentic dishes. Gasthaus Kopp: Great traditional Austrian food at solid prices. Popular with the locals. Kolar: No frills pita sandwiches and beer. Schachtelwirt: Traditional food served in takeaway containers. Great for a quick lunch. Berliner Doner Wien: Excellent kababs for under €4. Aera: A solid choice of typical home-style Vienna’s food. Swing Kitchen: Pretty good burger chain. Expect to pay about €3.50 for a beer out. At a grocery, beer runs about €1 and a bottle of wine about €5. 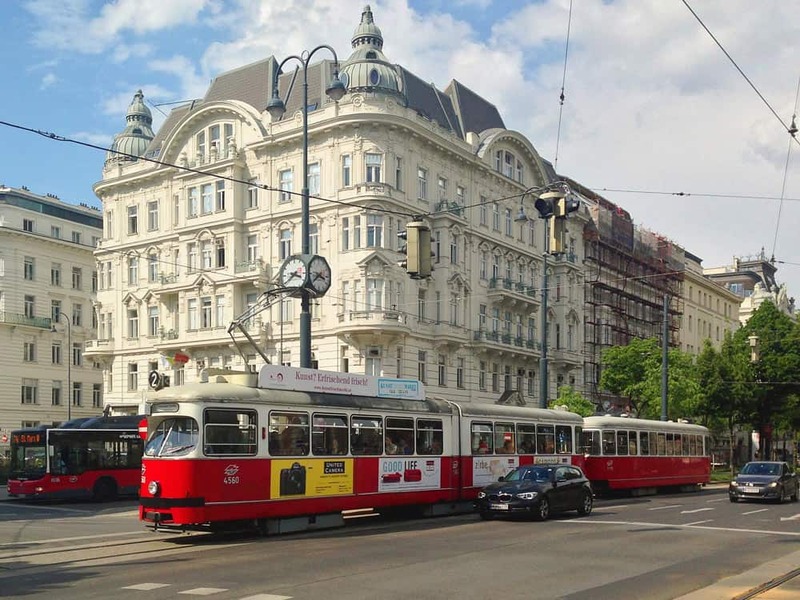 Vienna has a great public transportation system so you won’t have to worry about getting around the city. 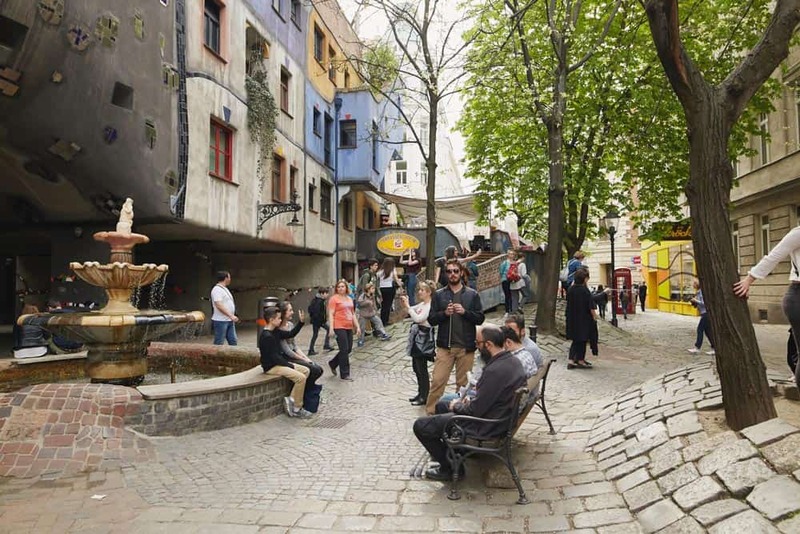 The city offers a Vienna Pass that provides access to all the transit networks in Vienna’s inner-zone (metro, train, tram, and buses) as well as discounted or free access to museums and attractions. By the way, if you get caught without a ticket the penalty is €105… so it’s not worth the risk. Tickets for Vienna’s public transit system can be purchased by the journey or by duration. When purchasing tickets, airport transfer tickets can also be added for €10. First hour free, with €1 for two hours, €2 for three hours, €4 for four hours, and €4 for every hour thereafter. Accommodation prices in Vienna aren’t too bad. Hostels are surprisingly affordable and there are a good number of budget hotels. Airbnb is also popular in the city, so that’s a good option if you want a little more space and privacy. You should budget about 22€/night per person for a decent hostel — although many hostels raise their prices on the weekend. Remember, these prices are for a bed in a shared dorm room. If you want a private room, expect to pay €55-€90+ total (for two people), so it’s probably a better deal to rent an apartment. Check out the latest hostel prices at Hostelworld since prices are always fluctuating. A decent budget hotel that is in the city center will cost around €90-€120/night. You can find cheaper hotels if you want to stay farther away from the center of the city or if you don’t mind staying in a super low-budget place. We suggest checking out Booking.com to see hotel prices for your dates since they’re always changing based on demand, time of year, location, etc. 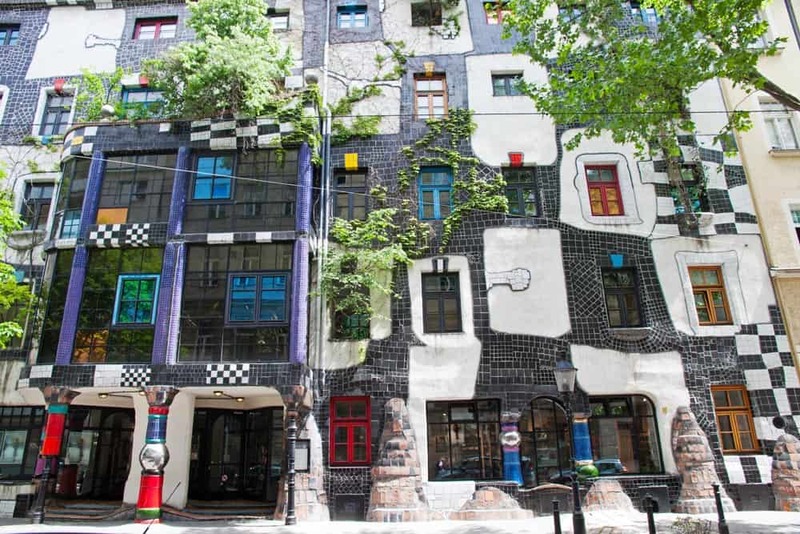 You won’t have any issues finding a rental apartment in Vienna but prices can be a bit on the high side. These rentals can be a good option for large groups or travelers who want a little more space (and a kitchen). On the other hand, there are a few downsides to rental apartments — like limited/inconvenient check-in processes and extra cleaning fees/service charges (which can make short-stays quite a bit more expensive). For short stays, we prefer hotels/hostels but rental apartments can be a nice option for longer stays.